South of Lima, Peru you’ll find some holiday communities spread out along miles and miles of lovely beaches, interspersed only with large rock outcrops and points. Although some beaches are a higher risk for swimmers, it’s extremely tranquil albeit if out of season. I visited this area during mid-October 2014, in particular the beaches of Punta Negra. During this visit I got the opportunity to see this area from San Bartolo (further south - some gardens here where we found Amazilia Hummingbird) to Punta Negra from the air during a flight with an ultra-light. This gave me an even better view of how expansive the beaches really are, over and above finding where 100’s of Peruvian Pelicans and Grey Gulls roost - at times probably well over a 1,000 birds. Without much difficulty it’s possible to pick up around 25-30 species of birds in a day including the town “locals” like Long-tailed Mockingbird, West Peruvian Dove, House Sparrow (the default sparrow here) and then the ever present Scrub Blackbirds. Not overly common here, the Vermillion Flycatcher also showed itself a couple of times. The beaches teem with birdlife though; seeing Grey Gulls relaxing on a remote part of beach in their 100’s is not uncommon. Gulls and terns at the southern beach of Punta Negra. They are usually joined by Belcher’s Gulls and the odd tern like Royal and/or Elegant Terns. Whilst there are many Inca Terns, (probably one of the most beautiful terns! ), the more uncommon Peruvian Tern also graced us with its presence for a few minutes the one day, just enough to get a record shot to confirm for ID. Elegant Terns in flight over beach; some Grey Gulls in the background. The beaches north of Punta Negra town stretch out far and this where early morning I found some large groups of waders dominated by Black-bellied Plovers and Ruddy Turnstones. Between them there might be some Sanderlings on occasion with the lonely Whimbrel passing by. One morning though there were about 6 Whimbrel on this stretch. Along here is where the Red-legged and Neotropical Cormorants seem to prefer fishing with Peruvian Boobies and Pelicans flying and in the water further offshore. One day we had a massive continuous flock of Guaynay Cormorants flying south very low above the water - at times it was almost like clouds of birds as they came around the point north of Punta Negra. The large point at Punta Negra is where the Peruvian Boobies, Neotropical and Red-legged Cormorants have their roost. My friend showed me that contrary to what some sources may say about Red-legged Cormorants being solitary, here it’s possible to find them roosting in groups of 10 or more. The American Oystercatchers are very common here with fair numbers of Blackish Oystercatchers at times but don’t seem to reach the numbers of the American species. 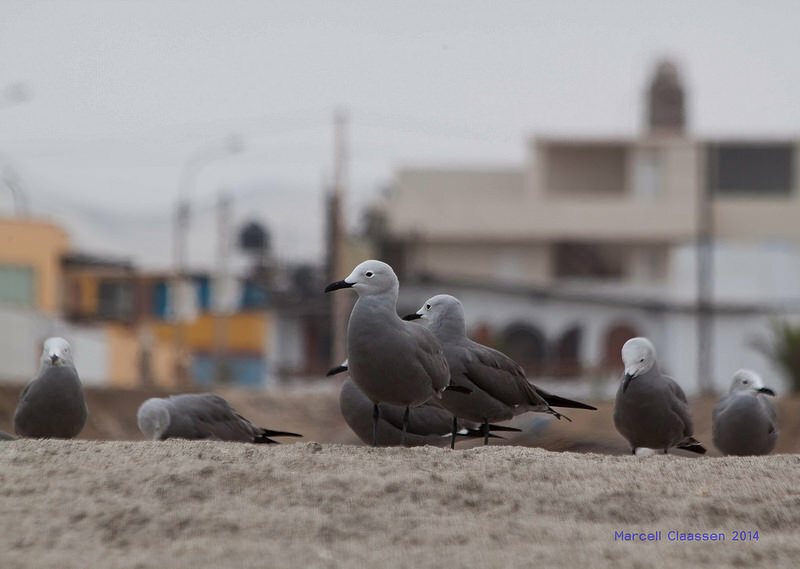 Keep a lookout for the Peruvian Surf Cinclodes which will very likely be hopping around on some beachside rocks. All in all some good birding to be had along the beach and in the area plus then if you prefer, some relaxing time along deserted beaches and catching some sun if you’re so inclined. Sunset is a must along this beach with breath-taking colours as the birds settle in for their roost. For more photos from Punta Negra, view my album on Flickr here.